As President-elect Donald Trump prepares to take office, the public views one of his signature campaign promises – the construction of a wall along the U.S.-Mexican border – as a less important goal for immigration policy than several other objectives, such as cracking down on visa overstays. Asked about eight possible goals for U.S. immigration policy, majorities rate each one as important, except one: Only 39% view building a wall along the U.S.-Mexican border as a very or somewhat important goal. Most Americans (58%) say it is important to increase the number of deportations of people in the U.S. illegally, another of Trump’s campaign proposals that he has emphasized since winning the election. The latest Pew Research Center estimate puts the number of unauthorized immigrants in the U.S. at 11.1 million. The most widely supported goal for U.S. immigration policy is to establish stricter policies to prevent people from overstaying visas. Nearly eight-in-ten (77%) view this as an important goal, according to a Pew Research Center survey conducted Nov. 29-Dec. 12 among 4,138 adults on the nationally representative American Trends Panel. In fiscal year 2015, nearly 400,000 visitors to the U.S. overstayed their visas, according to a recent estimate by the Department of Homeland Security. Among other immigration goals, 73% say it is important that those in the U.S. illegally do not get government benefits if they are not qualified to receive them, while 72% say it is important to allow people who came to the U.S. illegally as children to remain in the U.S. and apply for legal status. In addition, about six-in-ten (62%) say it is very or somewhat important to establish a way for most people here illegally to stay legally, while 61% say the same about taking in civilian refugees from countries where people are trying to escape violence and war. As deportations of undocumented immigrants have fallen in recent years, 58% say that increasing the number of deportations is an important goal for U.S. immigration policy. An identical majority (58%) says it is important to encourage more highly skilled people from around the world to live and work in the U.S. 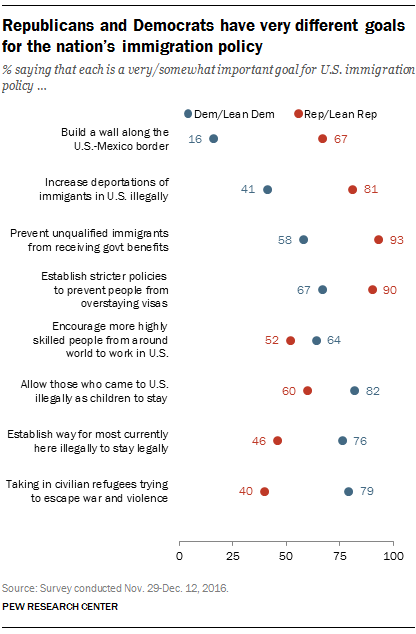 There are partisan differences on each of these goals for U.S. immigration policy, but the widest by far is over building a southern border wall. Two-thirds of Republicans and Republican-leaning independents (67%) say construction of a wall on the U.S.-Mexico border is an important goal for immigration policy, compared with just 16% of Democrats and Democratic leaners. While most Republicans regard a U.S.-Mexican border wall as an important goal, larger shares of Republicans see other goals for immigration policy as important: 93% say it is very or somewhat important to prevent immigrants in the U.S. illegally from receiving government benefits they are not qualified for; 90% say it is important to establish stricter policies to prevent visa overstays; and 81% see increased deportations of those in the U.S. illegally as important. Among Democrats, the most widely supported goals are allowing people who came to the U.S. illegally as children to remain and apply for legal status (82% say this is important); taking in refugees trying to escape violence (79%); and establishing a path to legal status for most immigrants in the U.S. illegally (76%). Despite the wide partisan differences on many of these goals, four of the eight proposals are viewed as important by majorities in both parties. For example, while 90% of Republicans say it is important to devise policies to prevent visa overstays, so too do 67% of Democrats. Note: See full topline results in a PDF, which was updated May 3 to include only questions related to this post.